Some items used by inspectors are hard to find, so we have assembled a collection of quality equipment from a variety of vendors at affordable prices. 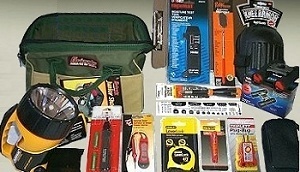 All the items we sell are useful tools that we personally use in the field. Every from PHII comes with a 30-day money-back guarantee. Moisture Meter, Compact Binoculars, Wide Mouth Tool Bag, Pivot Light w/Battery, Non Contact Voltage Sensor, 4-bit Fiberglass 2000v Screwdriver, Kneepads, Electrical Current Tester, GFI Receptacle Tester, Inspection Mirror, Saunders Clipboard, Paper Filter Masks (5/pack), Line Level, 12' Tape Measure, Service Entrance/Wire Gauge. 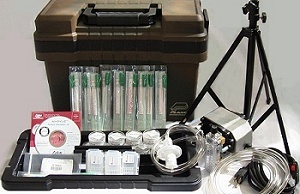 Powerful 30 LPM IAQ Pump (120 volts) with integrated combination flow meter/regulator valve, Tubing (10 feet), 52-inch Sampling Stand (collapses to 16-inches), Bioisolation Filter, Deluxe Toolbox Style Carrying Case (18" x 9" x 13.5"), 10 Air-O-Cell® Cartridges, 10 Mold Sampling Swabs with Containers, 10 Bio-Tape Surface Samplers with Cases. 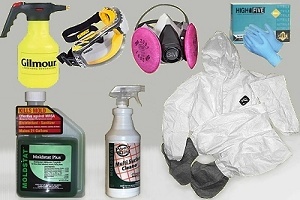 MoldSTAT PLUS Concentrate, MoldSTAT Peroxy Kling, Gilmour Hand Sprayer, Tyvek Coverall with hood and boots, Disposable Nitrile Gloves 100-Pack, 3M Half Faceplate Respirator, 3M Respirator Filter 2-Pack, Anti-Fog Mold Safety Goggles. Instantly displays the condition of the wiring for all grounded 120 Volt AC outlets. Also tests the circuit breaker in GFI outlets in bathrooms and other areas. UL listed. Essential when testing for electrical current on components not connected to conventional outlets. Also allows you to test 2-prong ungrounded outlets. Checks AC/DC 80-500 Volts. UL listed. Senses live electrical current without contact. Use before touching or removing electrical service components. Two AAA batteries included. Audio chirp alert and flashing red light. Pocket clip. Rugged stainless steel head assembly with 1" x 2" oval mirror. 360 degree all-angle-viewing for fast, accurate visual inspection of hidden areas. Attached pocket clip to carry it safely in a shirt pocket. Fiberglass reinforced 4-in-1 screwdriver UL tested and safe up to 2000 volts. Rare earth Neodymium magnet hardened bits. Lifetime guarantee. High-quality foam kneepads. Lightweight and easy to slip on when inspecting an attic or crawlspace. Self-contained metal contact probes with 4-light system to detect moisture problems as low as 14 to 20-percent. 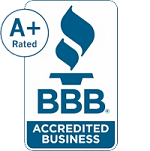 Test hard or soft wood, sheetrock, concrete, plaster, carpet and more! 7-inch industrial 6-volt lantern by Rayovac with long-range beam and krypton bulb and waterproof. Swivel stand allows lantern to be stationed in place. Includes battery and lifetime warranty. This 13 x 8 x 8.5-inch all-purpose tool bag made of tough ballistic nylon with 6 pockets outside and 15 pockets inside. Wide mouth with padded sides. Vanguard 10 x 25 compact binoculars with ruby lenses. Rubber armored with a field angle of 5.8 degrees, fold inside a compact carry case. Lifetime warranty. Non-conducting gauge helps identify the capacity for copper/aluminum Romex service entrance cables, and non-insulated household wire sizes. Table with breaker sizes for cop/alum wiring.